Montreal’s Answer to the Riddle: What’s Arab, Muslim and Funny? But one person is giving Muslim comedy its proper diction—a young woman who is known onstage simply as Eman. Although Eman Al-Husseini claims to love her last name, not many people have the opportunity to be known solely on a first name basis, so why not flaunt it? But unlike Madonna—an idol of hers, coincidentally—things ain’t always so easy. Being a comedienne of colour, audiences expect to hear about her exotic upbringing, she said. Like many children of Middle-Eastern parents, Eman was pressured to go into one of the “big three” careers: lawyer, doctor or engineer. “[Me becoming a] doctor, they gave up on quite easily,” she said. “[They’d have settled for me] just being an accountant. My father thinks that I could have been a great politician because he finds me very charismatic. If people expect Eman’s comedy to be political because of her ethnicity—although born in Kuwait, her family hails from Palestine—then they certainly don’t expect there to be quite so much swearing. If Canadians are interested in her Middle-Eastern roots, then Middle-Eastern audiences are fascinated with what it’s like to grow up Canuck. 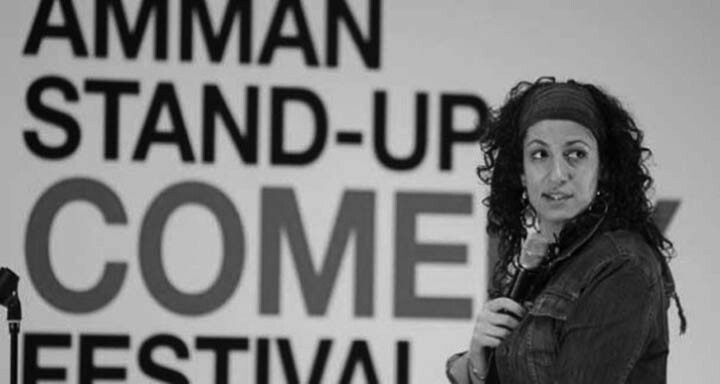 A frequent participant in the New York Arab-American Comedy Festival, Eman was invited in 2008 to participate in the first-ever stand-up comedy festival in the Palestinian city of Nazareth, for which she briefly appeared in headlines across the world, including France and Israel. “We know standup comedy is an American concept,” she says, “but the Middle-East has embraced it so much. Now with an international reputation, she had a chance to perform last year in Amman, Jordan. Next month, she’ll be touring the Palestine Territories, including stops in Nazareth, Jerusalem and Ramallah with fellow Arab comedian Maysoon Zayid. “Being Arab has helped me travel. Isn’t that crazy?” she joked. Eman discovered her love of comedy from a Kuwaiti sitcom her mother used to tune into. After moving to Montreal in 1990 during the midst of the first Gulf War and settling into a French school—which is mandatory for all immigrants, although Eman says she’s fortunate to have had the experience—it would be years before her thoughts returned to pursuing comedy. In 2006, while driving home from work in the city to her home in the West Island, Eman’s car slipped on some black ice. The culprit? She hadn’t purchased winter tires, which were not yet mandatory by law. Exactly what happened afterwards is difficult to recall, she said. When she regained consciousness, she learned that she had received 32 stitches to her forehead, but didn’t suffer any internal injuries. The car, however, was totaled. Her parents were disappointed, but nevertheless supportive. “It broke their hearts at the beginning,” she says. “It’s not easy, financially speaking. When you start making money, you’re making $30-40 a set in comedy clubs, and you’re not established until you become a headliner, and even then you have to market yourself properly. Since 2007, Eman has been working at the Montreal ComedyWorks, where she hosts BOOM, the Best of Open Mic, monthly. The thing with comedy, said Eman, is that it’s not what you’ve just done, but what you’re about to do next that’s important to finding success. With that in mind, she’s decided to focus her efforts on embracing her home and native land: Canada. You can catch Eman every Monday night at the Montreal ComedyWorks (1238 Bishop St.), where she hosts an open mic. The best two performers as chosen by the audience will have the chance to compete in BOOM, the Best of Open Mic, on the last Sunday of each month.